DIS: You have been teaching with DIS since 2008. Do you think there has been a change in interest for Scandinavian film since then, based on the Nordic countries and their status in international film? Morten Egholm: I think the level of interest is the more or less same, but for the last few semesters many students have come with more knowledge about Scandinavian film at the start of the course. The main reason is that Danish cinema and television have become more and more the ‘talk of town’ recently. Lars von Trier’s latest films Antichrist, Melancholia, and Nymphomaniac, have had an international cast with Americans in some roles – and they seem to be known around American campuses. Danish films have also been nominated for Oscars in the Best Foreign Language category three times in the last four years. To name a few, the well-known Danish film, In a Better World, actually won in 2011, and more recently, A Royal Affair, and The Hunt were nominated in 2013 and 2014. Danish director, Nicholas Winding Refn, has a ‘bromance’ with Hollywood star Ryan Gosling, and the two teamed up in the cult hit Drive in 2011. And of course, we have our international film star, Mads Mikkelsen. Further afield in Scandinavia, two films have also been internationally recognized – Norwegian blockbuster war film, Max Manus, and Kon-tiki (also Oscar nominated) about an international famous Norwegian world explorer. 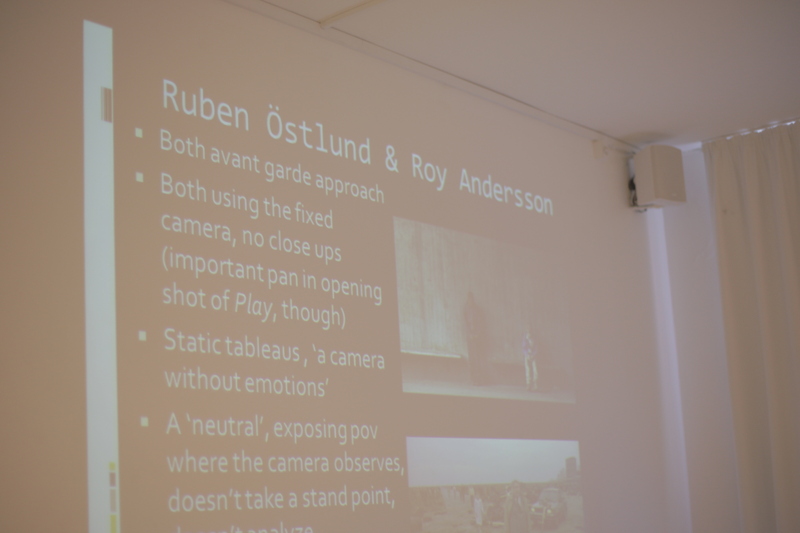 DIS: When you’re not teaching at DIS, you often guest lecture about film studies at the University of Copenhagen and write and edit for Kosmorama, Denmark’s oldest film magazine. What initially sparked your passion for film? ME: We have all grown up with films, and for most of us, important memories are linked to film we have watched as kids. But when does it become a passion? Good question! I think it started pretty early for me, because already at the age of six and seven, I was interested in all kind of movies especially those by Charles Chaplin; The Gold Rush, City Lights, Circus, and Modern Times were my favorites back then, and nowadays I would add The Great Dictator and Monsieur Verdoux). And then there was another decisive event: In the summer 1986, when I was fourteen, the Cannes Film Festival celebrated its fortieth anniversary. On that occasion, Denmark’s Radio, the only channel on Danish television until 1988, decided to show some of the Golden Palm Cannes winners over the years. That really meant a lot to me, as I suddenly realized that film was not only entertainment, but it could also be art, with unconventionally aesthetic appeal as well as thematic. Overall, the three films that made the biggest impact on me were Luis Bunuel’s Viridiana (1961), Vittorio de Sica’s The Miracle in Milan (1953), and Martin Scorsese’s Taxi Driver (1976). Thus, long live Denmark’s public service television, who dares to show something that people didn’t even know they wanted! DIS: Fall 2014 brings yet another core course to European Humanities! Tell us about the highlights of your new Modern Frames: European Art and Cinema course, which you will co-teach with Andrea Homann? ME: It will be an introduction to visual arts in Europe, especially in the 20th and 21st century. The focus will be on the role that modern film and art plays in different periods in European history, and what subversive and alternative expressions film and art find in different social contexts. When it comes to film, we will explore many different aspects, spanning from German Expressionism and French/Spanish surrealism, to modern Eastern European cinema. DIS: Without giving away too much, can you talk specifically about the relationship between European visual art and film studies? What about the combination of these topics, makes this core course of particular interest? ME: Andrea and I will be the experts in each of our fields, visual arts and film studies. Andrea will be responsible for getting students out of the classroom to visit museums, and maybe even more importantly, find art in public spaces. Both of these experiences of viewing art will help us analyze the significance of art and in its context. My approach will be the opposite: to get students into the darkness of the DIS movie theater to experience another way of telling a story, depicting characters and using visual elements. We’ll analyze how both approaches are actually on the same track in their artistic expression, only by using different visual strategies. DIS: Your core course will travel to Prague for the week-long study tour. What makes Prague a unique study tour destination? ME: The city was one of the first to start a national film school. It happened in 1948, which was a transition period for the country, as it had been liberated from Nazi Occupation, and in the same year, it turned into a communist regime. The interesting thing is that the communist regime didn’t close down the film school, and in the sixties, directors were able to make the movies they wanted. The result: some of most interesting European films ever made were produced in the Czech Republic in the 60s. It also means that film is a very important art form in their country today. So, on our study tour we will meet a lot of film experts as well as visit FAMU International, the Czech national film school. We’ll also meet with the contemporary sculptor David Cerny, probably Prague’s most controversial artists, and travel to the quaint town of Cesky Krumlov where we’ll explore the Egon Schiele Art Centrum. 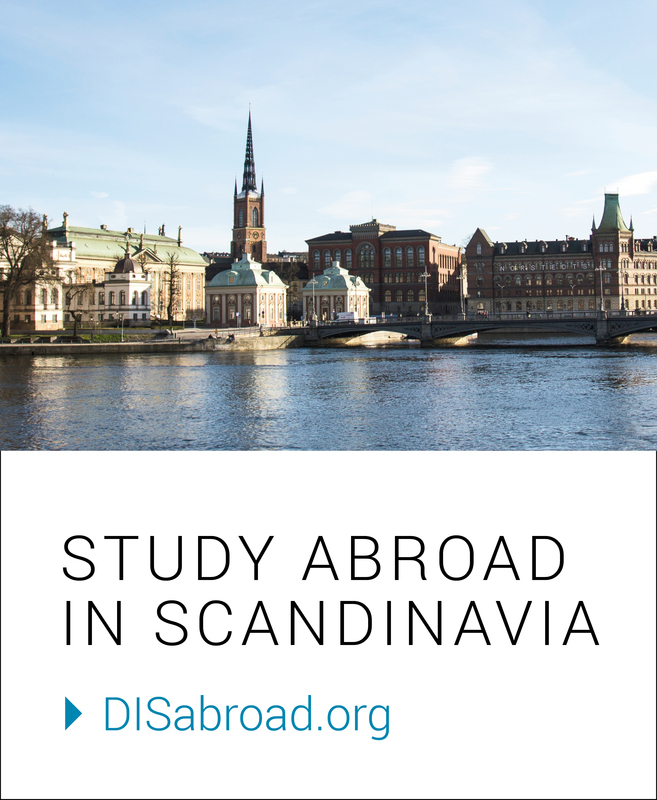 DIS: Aside from sharing European film studies with DIS students, you also teach the Danish Language and Culture course. What do you like about teaching Danish at DIS? ME: The fantastic thing about having a Danish class at DIS is that you have students with all kinds of academic backgrounds that are going learn about the same things: Danish language, Danish history, and Danish culture. There is often a very special – and creates a ‘hyggelig’(cozy) atmosphere in the class as students start to unlock the key to understanding the weird tribe that surrounds them for four months. 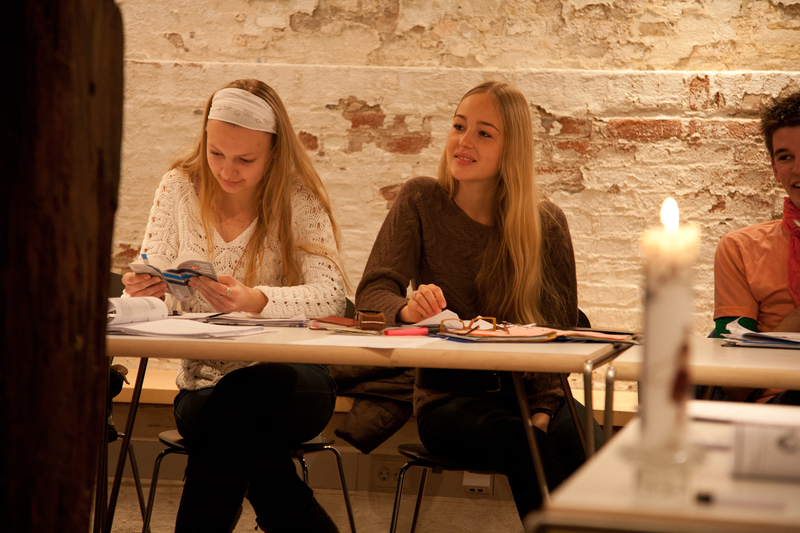 It is very important that we cover so many aspects of the Danish culture and mentality as possible, and I really think that the Danish classes at DIS offers something quite unique; besides learning the language, students also learn to look at Danish identity, history, and self-perception in a complex way. We, as the Danish teachers, try to avoid all kind of clichés and stereotypes about Danes. The final outcome should never be generalized concepts about Danes like, “now I know why they all wear black!”, but instead, students will form a rounded, complex, and versatile picture of what it means to be a part of a special Northern European society in the 21st century. DIS: You have a new elective course Birth of Modern Drama: Ibsen and Strindberg starting this fall. Tell us a bit about this course’s highlights? ME: This course is an in-depth introduction to the two world famous Scandinavian playwrights Henrik Ibsen and August Strindberg. Their most famous plays – A Doll’s House, Ghosts, and Miss Julie – are constantly being performed around the world. Each of the plays address themes that are both universal and very Scandinavian at the same time: female emancipation, the significance of social and family background, existentialist angst, being the loner against the group, and a constant debate of relevant society problems. Besides that, Ibsen and Strindberg are both extremely good storytellers. Many literary scholars would agree that Ibsen’s way of structuring a play has had an enormous influence on how stories today are told in Hollywood, and in good quality mainstream cinema with depth. During the semester, we’ll also watch adaptations of their most famous plays, as well as performances here in Copenhagen or Southern Sweden. DIS: Your elective course, Scandinavian Moods in Cinema, introduces a ton of ‘of the moment’ Scandinavian directors. Who is your personal favorite? ME: My personal favorite is perhaps Icelandic director, Dagur Karí, who has made three features: one in Iceland (Noi The Albino, 2003), one in Denmark (Dark Horse, 2005), and one in the U.S. (The Good Heart, 2009). He is able to combine dead pan humor with Nordic melancholy, minimalism, and beautiful visual aesthetics in a very unique way. DIS: If you had to recommend one Scandinavian film to a foreigner, which would you choose? ME: I’m afraid I have to cheat a little here and choose one movie from each of the five Nordic countries! The most important Danish film director ever is still Carl Theodore Dreyer and his film, The Word (1955). This film really blew me away the first time I watched it as a teenager. It’s extremely beautiful visually, and it is somehow surrealistic in its tone and atmosphere. Then, in its own way, it is Danish both thematically and within character roles. The most celebrated Scandinavian director ever is Ingmar Bergman from Sweden, so you should see at least one of his movies. I would personally recommend Wild Strawberries (1959), which can best be described as an existentialist road movie. In many ways, this film says everything there is to say about life! Reprise (2006) by Norwegian director Joachim Trier, the most celebrated Norwegian film ever, is about the struggles of a couple of young guys in their twenties who are dreaming about becoming writers. When it comes to Finland and Iceland, I would recommend Aki Kaurismäki’s Shadows in Paradise (1986) and Dagur Karí’s Noi the Albino (2003). Both of these films combine dark, minimalistic, dead pan humor with melancholy in a way you don’t see in film history.